With the continuing rapid growth of mountain biking, a lot of new trails are being built that encourage new and younger riders to get started in the sport. And, in my neck of the woods – existing trails have even been modified in the last couple of months to accommodate novice through intermediate mountain bikers as well as more hikers and horseback riders. I suppose this is fine in some areas because a growing population of enthusiasts want access to trails close to home that their entire family can enjoy. On the flip side, this is really upsetting to some advanced riders who desire new trails that favor a higher set of skills. And, trail organizations are put in the difficult position of doing their best to make sure everyone is happy. Taking all of this into account, it’s wonderful that the Horsethief Bench Drop-In is still in tact. When I saw someone clean this for the first time a few years ago, it was one of the most amazing feats on a mountain bike I’ve ever had the pleasure to witness in-person. If you’ve seen this stretch of “trail”, you know what I mean. The drop-in composed of several steep rolls and drops with a couple of hard turns thrown in for even more danger. Those who want their wrists, noses, collarbones and bikes to remain in tact just walk it. Some can make it about two-thirds of the way down until they get to the first gnarly step which is the first real crux. Just like his 10 year-old brother, our oldest kid, Wyatt – has had a fantastic season on his mountain bike. With the help friends like Steve Goodman of Hyland Cylclery; Courtney Nash and Eric Brown of WMBC – he has increased his skills exponentially this year. 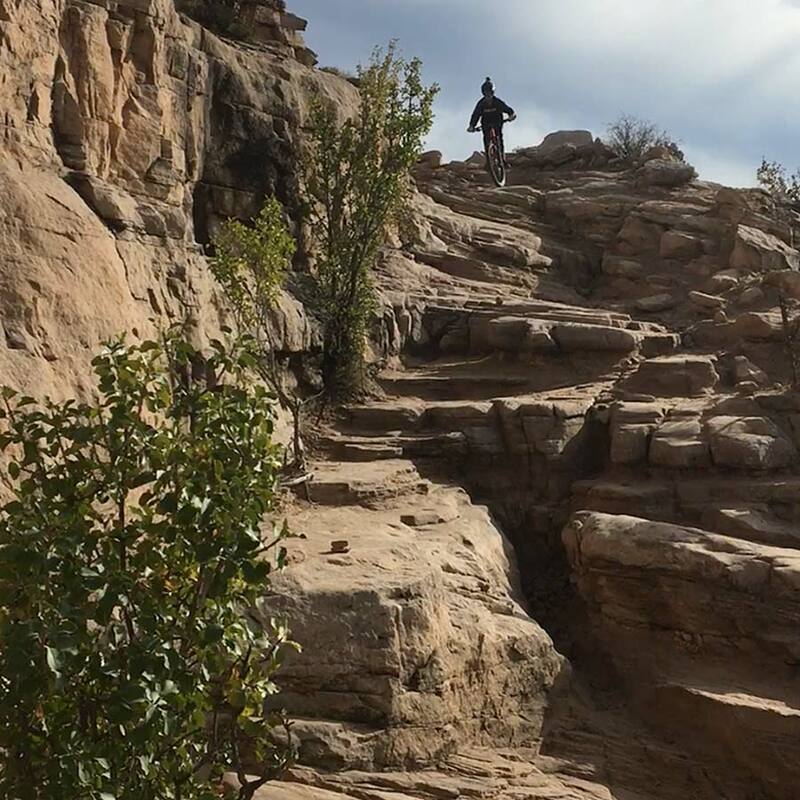 When we recently visited Fruita, one of Wyatt’s goals was to get the Horsethief Bench Drop-In off the list. After he marked his line with a few placeholder rocks and some sweeping, he got it on the first try.